Smencils are one of the fastest growing school and organization fundraisers. Smencils sell especially well in Elementary Schools, Middle Schools and Daycares. 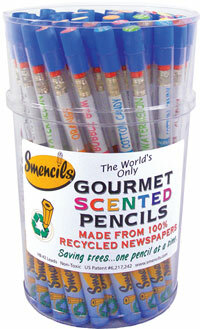 Smencils are made from 100% recycled newspaper soaked in gourmet scents. The scents smell so good that they can even make your mouth water. The scents do not fade faster either. Smencils scents are guaranteed to last at least 2 years! Smencils are one dollar sellers and come 500 to a case. If you are looking for other Smencil kit options, we can also help you find the best Mini Smencil Kits, Home Smencil Kits and Custom Smencils Kits. If you are looking to purchase Smencils, please fill out the short form below or call (866) 674-7317 and we will find the fundraising dealer that will provide the best profit for you and your group.